Well, yesterday the PPCC braved a torrential downpour, gushing sidewalks and a broken flip-flop to visit our trusty Uncle Everything DVD-wallah ji. Uncle E ji's really got almost everything, and he prides himself on being the premier supplier of Hindi DVDs in the country. (Very possible. He's certainly our premier supplier.) Anyway, after a huge disappointment when Uncle E ji's only Tamil films were Aaj Ka Boss (which, as the title implies, is not actually Tamil but Hindi) and an ancient, unsubtitled, black and white film from Singapore (?! again, not actually Tamil, but what do any of us know apparently), we requested our usual binge of Anil Kapoor films. At this point, assistant Nephew Everything had a brainwave and said, smiling, "I am thinking you are very keen on Anil Kapoor lately." The PPCC smiled with a distant look in our eyes. "Yeeeah. Gosh, he's dreeeamy." We felt a haze of affection coming on. "Well," Nephew E said, "Have you seen... JAANBAAZ?" Gasp! The infamous Jaanbaaz of the infamous roll in the hair hay scene? 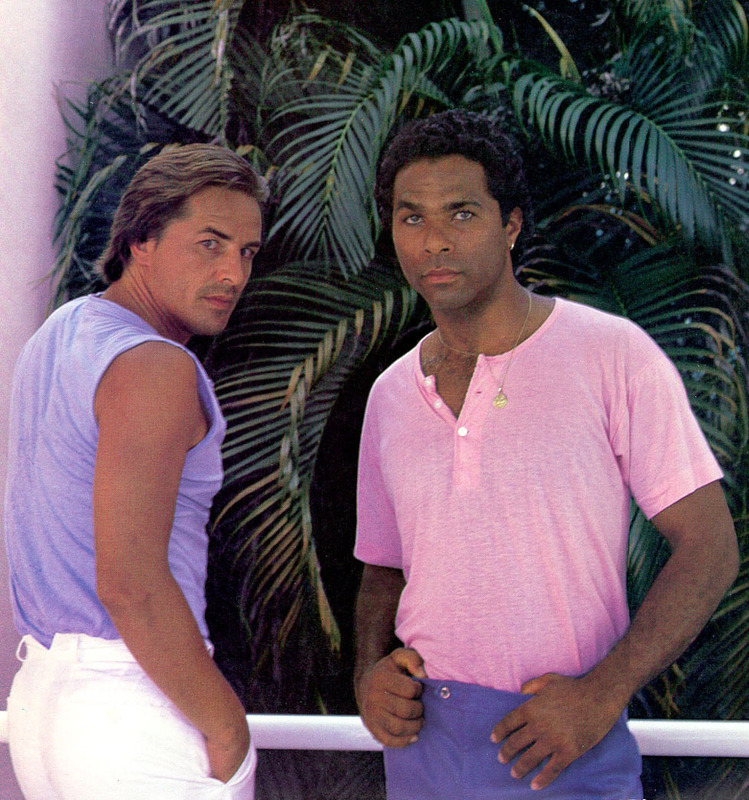 Isn't that one of those hilariously seedy Miami Vice-esque drug movies, too?! And one of the few films the all-forgiving and always-optimistic Rum... disliked?! "No, we haven't," we said. "But we have a perverse curiosity to watch it RIGHT NOW!" "Set!" He added it to the pile. "Have you seen... Jeevan Ek Sanghursh?" "Jeevan Ek Sanghursh," he said, enunciating loudly over the thundering rain. "It's Anil Kapoor." "Uh..." We were skeptical. After all, the Es had just tried to pawn off a movie from Singapore as being Tamil. Who knew what Nephew E was talking about. We gasped. "Oh my God, YES PLEASE!" "And look, it's a two-in-one," he chirped happily, "with Rajkumar!" Oh God. 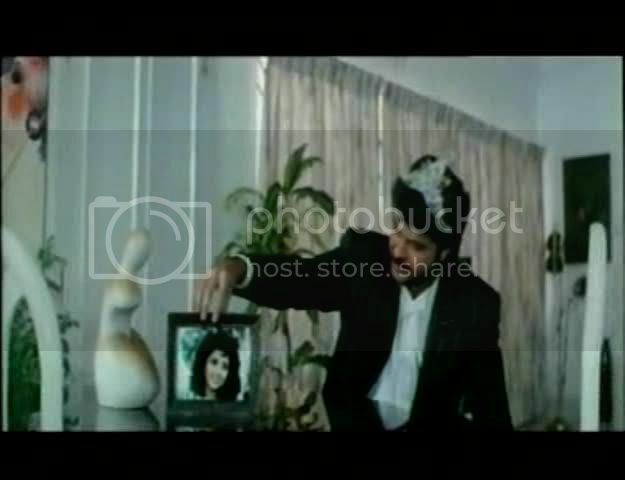 Now we at the PPCC KNOW that Rajkumar was hideous, but a mystery Anil/Madhuri movie was just too hard to resist. Had we just bought a two-in-one faux medieval-done-badly Anil/Madhuri themed DVD? We decided to watch Jeevan Ek Sanghursh first and find out. Maybe because your mother is DEMENTED. 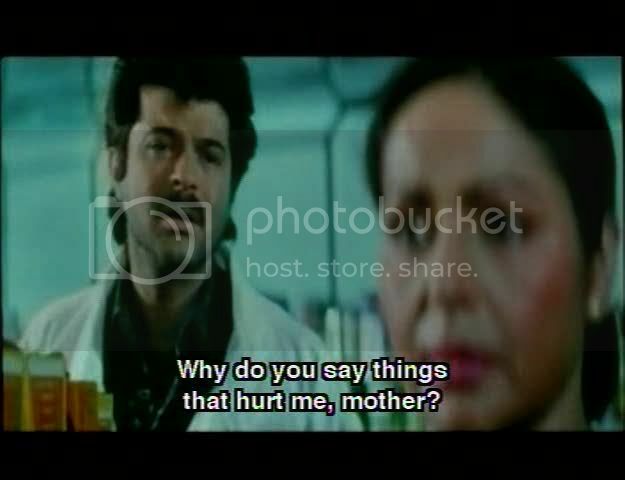 Penned by Javed Akhtar, one of Hindi cinema's premier screenwriters and lyricists, and starring the dyn-o-mite combination of Anil Kapoor and Madhuri Dixit, with a strong helping of Rakhee in her most ridiculously insane Demented Mother mode, Jeevan Ek Sanghursh (Life is a Struggle) turned out to be an inoffensive fluff piece with a few genuinely charming moments. It features one of the laugh-out-loud funniest scenes ever - a scene that was like something out of Monty Python, a scene that was on the level with the infamous moment in Sharmilee where Shashi drops the baby. That definitely merits some respect. The story begins with your usual masala prologue, except today, since the mother is played by Rakhee, things go demented pretty quickly. Rakhee has three children: two sons, Arjun and Karan, and a daughter, Suman. After the younger Karan, in his rapscallion ways, picks one too many pockets, Rakhee speedily disowns him and sends him to the orphanage. After a pang of guilt, she decides to at least visit the orphanage once to let him know that they're leaving town - except apparently he's run away! Oh well, she thinks, she has train tickets for Mumbai this afternoon - no time to waste looking for your prodigal eight-year-old boy! Funnily (and typically), Karan has also made his way to Mumbai, where he's picked up by a kind-hearted garage owner. At least someone cares. Karan grows up into Anil Kapoor, and, when not tending to his mustache or outrageous fashion sense (two trousers he's stitched together at the crotch?! ), he lives in a converted double-decker - possibly the pimpest pad ever. On Day 1 of the narrative, Karan picks up a huffy lady, Madhu Sen (Madhuri Dixit! ), who's all nouveau riche and pompous attitude. This is another one of those instances where, because it's Madhuri, we love her so much, but if it had been Sridevi... well, that's another story. On Day 2 of the narrative, Karan - through the twists and turns typical to masala - ends up working for Dr. Devraj Kamat (Anupam Kher), a doctor/vigilante criminal mastermind who orchestrates heists in the name of cleaning up the streets, and whose arch-nemesis is the evil mafioso, Rattan Dholakia (Paresh Rawal), who's just bad in the normal, greedy way. Both the villains were disarmingly silly: Dr. Devraj obsessively perfuming his hands, while the gluttonous Rattan yawned and gobbled up food continuously. Anyway, Karan's first vigilante justice job: to intercept a load of cocaine and dispose of it. This leads to the funniest and most outrageous scene, when Karan attempts to dispose of the a ton of cocaine by burning it on the beach... right next to an open-air cafe at the local hotel! 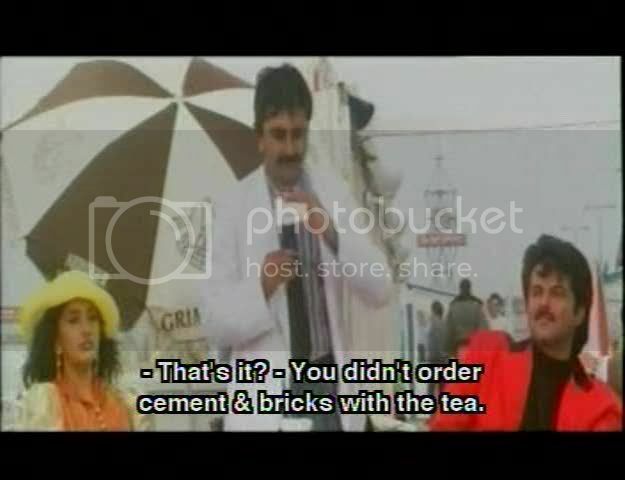 Inadvertently, clouds of crack drift through the hotel and everyone - Karan, Madhu Sen (who he inadvertently runs into during every heist), the waiters, the other patrons - gets high, and everything becomes immediately very surreal. "Like a decent man," Karan says in a monotonous haze, "I take tea on a camel. Waiter, bring me two pots of tea and one hot, hot camel." The waiter pours milk all over himself. Madhu starts giggling uncontrollably ("The hotel's brakes are broken!") and then dissolves into tears ("Where have my arms gone?!"). And this is all followed by a bizarre song, where the drug-addled Karan and Madhu romp through a series of nightmarish settings - miniature cities, undulating roads, smoking skeletons, Escher paintings. We've never seen anything like this in masala before - unless you count Anil and Rani's hallucinogenic romping in Nayak, though at least that was only implied. ("We've eaten a 'papaya' and taken some 'paan' and now we're going to roll around in the grass, wheeee!") Here it's explicit! And what's even stranger: this highly controversial scene (for the love of God, they just inhaled CRACK!) isn't demonized, but rather played for sitcom-style laughs! Oh Hindi cinema, you never cease to amaze us. Anyway, after everyone's recovered from those hijinx (PPCC included), the story tumbles along to its next masala port of call: the family reunion. Now usually the PPCC is all about reunions, but we found this entire section of the film tiresome - basically, Karan finds his family in Mumbai and, too shy to reveal his true identity, spends a lot of time gazing with puppy-dog eyes through windows and across streets. But it was a little hard to sympathize with the truly demented mother. Even after Karan finally announces his identity, she still kicks him out. So Karan spends the rest of the film making puppy-dog eyes at her while she keeps repeating variations of, "Get away from me! I don't like you! I don't want you as a son! Shoo!" In the end, the film dissolves into some gratuitous and incomprehensible dishoom dishoom, involving both crime bosses (Dr. Do-Good having now slipped into Just Evil mode as well) and people misusing hospital gurneys. Yawn. Oh, you two loons. We love yous. What do you have to say about Madhuri Dixit's marriage? Obviously, I felt bad initially (smiles). I said, 'Oh God, she is gone!' She is a friend and I felt happy for her. I think she has become more mysterious and exciting after she got married. When she was unmarried, it was impossible to get her. Now, it is next to impossible. I don't think in this life, I will be able to get close to her! But I was fortunate enough to come close to her in all my films -- I wooed her and got married. I fell in love with her and she reciprocated, on celluloid at least. Among all the heroines you've worked with, who do you think complements you the best? I think Madhuri. We made the best pair. Most totally! When's the comeback film?! Anyway, as this film's narrative got further bogged down with Rakhee's dementia and tiresome indignation, the Anil/Madhuri songs became the sole source of any fun. With music by Laxmikant-Pyarelal, all of them were fab - from Madhu's initial Clockwork Orange-style nightmare about the predatory Karan and his Alex-like goons (hey, we'd be scared too!) in Bachke Tu to their adorable excursion to Holland (complete with baffled Dutch onlookers!) to - and this one was our favorite - the romantic and ridiculous Mil Gai. Jeevan Ek Sanghursh isn't a particularly good film - Rakhee makes sure of that - but it is memorable for the comedy and likable for Anil, Madhuri and Anil/Madhuri. Poor Raakhee, she was so misused as a Ma. But I think I could tolerate this, if just for the cracktastic comedy scene. And I must say, that if I only go by the screen caps you shared, Rajkumar looks kind of like my sort of film! I might have to take a chance on it, although I generally trust you (it's me I don't trust). So I guess, next stop: Rajkumar? Enjoy the puffy shirts. awwwwwwww i remember seeing this at 8, and laughing at how stoooopidly fun it was! Anil + Madhuri make up for so many filmi faults... I don't know if I could sit through this or not. Maybe somebody (bored students, I'm looking at you) can compile all the Anil/Mads bits into one half an hour clip! Memsaab - Noooo! Rajkumar was only one of two movies that were so bad, I couldn't even write a review for them. It was just abysmal and dull. Amrita - If I may pull a Rakhee here, "NAHIIIIIIN!" Rum - I LOLed a lot during this film as well! Rum2 - And I LOLed at this comment! OMG sleazy double entendres, here I come. Filmi Girl - Yeah! Now THAT would be a good movie. And they're certainly distinct/detached enough from the whole reunion plot. Ok this one I'll stay away from but I really liked the review, thank you PPCC.